Show off a collection of ornamental plants. Any such a narrow land can be utilized. Vertical so the solution method. Ever heard about the Vertical garden? Method suitable planting this one, could be one solution to gardening in small fields. Those who live in urban areas, where the size of the land so often the case, would love this idea. In the world of agriculture, Vertical garden quite popular. The problem, though cultivated in small fields, the results can be as much as the cultivation of a wider land. Usually cultivated plants using paint cans are made story. Can be assisted with a wooden or metal framework made as a shelf. Let us adopt this way of farming to the house. In the narrow area, in the alley beside the house, for example. Planted all the plants directly into the ground, is nearly impossible. In exchange, planted it in the pot. 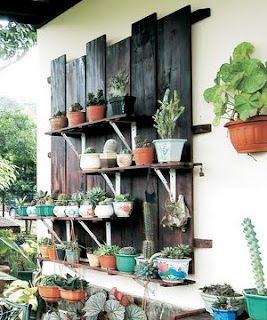 Make a rack out of wood or iron, put pots of plants were there. Could also make a shelf on the wall. Hanging pots, also one Vertical garden cultivation. In order to accommodate more plants, hanging two pots in a string context. Make a garden in this way is different from him directly on the ground. Choices were different plants. Park use Vertical garden many pots, so choose the plants that the leaf canopy is not too wide. Tongue-in-law, cactus, maidenhair ferns, ferns, etc., could be an option. For hanging pots can select plants whose leaves are hanging, it looks more interesting. Well after so, do not forget to take care on a regular basis to keep the plants thriving.